Home > News > CHAS celebrates 125 years! 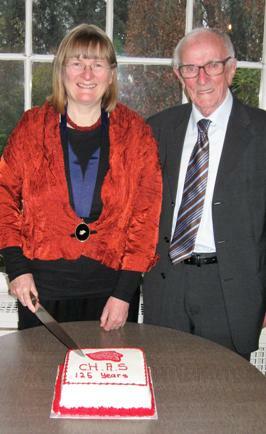 Dr Clare O’Halloran, CHAS President, and Prof. John A. Murphy, guest of honour, cutting the CHAS 125th birthday cake. The annual Christmas lunch was held today at Maryborough House Hotel and, as usual, we had a speaker to entertain us before the meal. This year it was great to hear Corkonian Shane Lehane (Head of Business and Humanities at Coláiste Stiofáin Naofa) speak about Christmas traditions in times past. Most evocatively he recalled the many customs, not only in Cork, that people engage in during the dark days of the winter but he focussed in particular on how it seems to be important for humanity to try to keep Christmas customs the same so that we can draw security from this in a time of the year when the dark is outside. Shane spoke also about the house cleaning that took place to prepare the house for the festive season and it was fascinating to hear about an old custom that involved pulling a feathered gander through the chimney in order to clean it! Dr Clare O’Halloran, CHAS President, reminded us all that the Society is now 125 years old and there was a festive cake to celebrate this. The guest of honour this year was Prof. John A. Murphy, former President and Hon. Editor, who spoke about his long connection with the Society. Next Post Ogham in 3D – 21st century stones!